Ever receive one of the Postcards from a Lawn care company and there is an amazing lush lawn on the front? 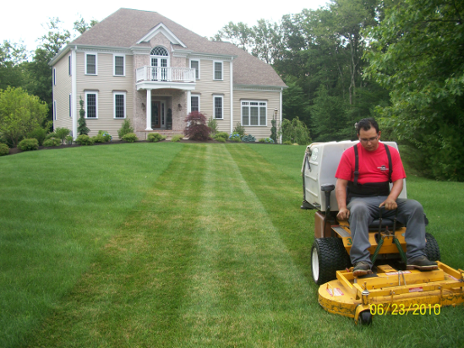 Do you get the impression that by hiring them you will have a beautiful lawn like the picture? 16 years in the business has taught me that it is simply not that simple. There are several key factors that need to be addressed above and beyond the treatments you sign up for…. The lawn treatments are only 40% of the solution. Many variable can take away the effectiveness of a good pre-emergent product i.e. timing, watering, weather, lawn thickness, soil, PH, history of the lawn. The Secret! A thick lawn is the best control of Crabgrass. A properly timed and maintained lawn needs regimented seeding to out-compete crabgrass and weed infestation. If the lawn has any bare areas the crabgrass will eventually fill in those areas and multiply. Eliminated those bare areas are essential to the future success of your lawn. A thick lawn is the solution to many lawn problems and should be a main priority to those seeking a “postcard lawn”.